BLEACH LONDON are probably the coolest brand on the block right now. Grunge vibe, insane hair styles + colours, what more could you want? With a salon in London, there isn't a colour BLEACH won't do. Whether you're interested in turquoise dip-dye or a full of head neon pink and blue - there's no limit. I've been eyeing their home-dye-kits in BOOTS for ages now but I think I'll have to take a trip to their salon and leave it to the pros. I'm actually super interested in BLEACH as a brand, so I'm really up for finding out more! With an iPhone app, [that I'm obsessed with] that edits your photos, adds stickers and gives you a direct link to shop their products - BLEACH have every area covered, whether its Twitter, Instagram or Tumblr...they're on it. I have been dying to get my hands on some of their haircare products, so I decided to give their Swamp Spritz [£6] a go and oh-em-gee, I love it. There's nothing I love more than textured messy hair and although I'm lucky enough to have insane curly hair naturally, when I straighten it, all the life just goes...but this Swamp Spritz gives it all back. How boring does my hair look after looking through BLEACH's instagram?! I know...I need to get dying some mad colours ASAP. Firstly, 'Swamp Spritz' what-a-cool-name, it's so unique, another great trait of BLEACH LONDON, and yanno, who doesn't want to use something called 'swamp spritz'?! The spray itself smells so fuxking good. Kind of like mens aftershave [as described by my mate] but it's that mens aftershave you kinda want to wear yourself 'cause it smells so good. The nozzle on the spray has three settings, 'off', 'spray' or 'stream', I use 'spray'. It evenly distributes the spray into your hair, the liquid itself isn't sticky or heavy which is a bonus. I scrunch my hair a bit after applying the Swamp Spritz and it's that easy, instant messy waves and texture. If you're looking for a good texture/messy hair spray, this Swamp Spritz [HERE] is the perfect solution. It's super affordable compared to other products on the market and it actually works. If you couldn't tell from this post, I am obsessed with BLEACH LONDON and I can't wait to try out more of their stuff, or even get down to their salon! 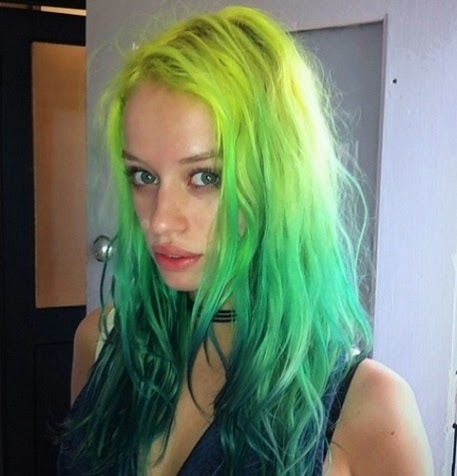 Coloured hair is so on trend this season, so why not go a little crazy? !